One of our favorite places to eat in Los Angeles is Western Doma Noodles, a quaint little Korean restaurant located in a tiny strip mall in the middle of Koreatown run by Baik, the sweetest lady in the world who makes everyone feel welcome. Although she doesn’t speak much English, she greets us every time with a warm smile and remembers that we are both vegetarian. It’s a special place for us. We had a lovely meal there for Ryan’s birthday in November before seeing the touring production of Beauty And The Beast at the Pantages. We always order the bibimbap, a signature Korean dish of seasoned vegetables served atop a sizzling-hot stone bowl of white rice topped with an egg and mixed with a generous spoonful of spicy chili paste. One of the best parts of Korean cuisine is the delicious banchan, small side dishes set in the middle of the table for everyone to share. Baik is so considerate and brings us an assorted vegetarian selection that is slightly different each time we visit. There are usually at least ten dishes to sample including Korean-style potato salad, steamed and marinated vegetables, pickled cucumbers and radishes, sautéed tofu, seasoned seaweed, and of course kimchi, an essential banchan for a traditional Korean meal. We were recently discussing fermented foods with our dear friend Christine at Yommme, and she mentioned to us that she had a delicious recipe for vegetarian kimchi that was easy to make. We fell in love with her roasted tandoori cauliflower that we wrote about in November, so we were eager to give this a try. We just made our first batch last week, and from the very first taste it was clear: this is, without question, the best kimchi we have ever had! Traditional kimchi is often made with fish sauce or shrimp, making it non-vegetarian. This version keeps all the tangy and bright flavors of classic kimchi, simply without the seafood. 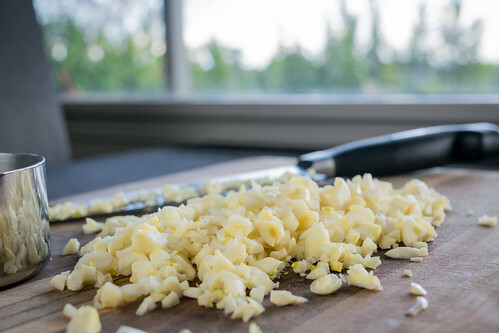 And just like our yuca recipe, this is chock-full of garlic. 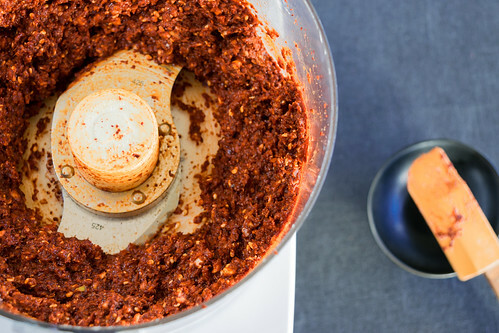 Using a half cup of minced cloves along with a quarter cup of freshly-grated ginger fills the kimchi paste with a powerfully bold and zesty aromatic flavor. 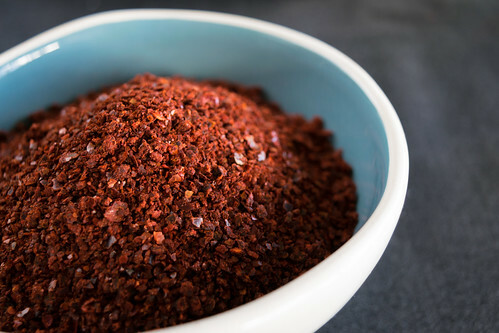 But the real spice comes from the Korean red pepper powder called gochugaru. This is the only ingredient not commonly found in grocery stores, but it is widely available at Korean markets or online, making it easy for anyone to try out the recipe. 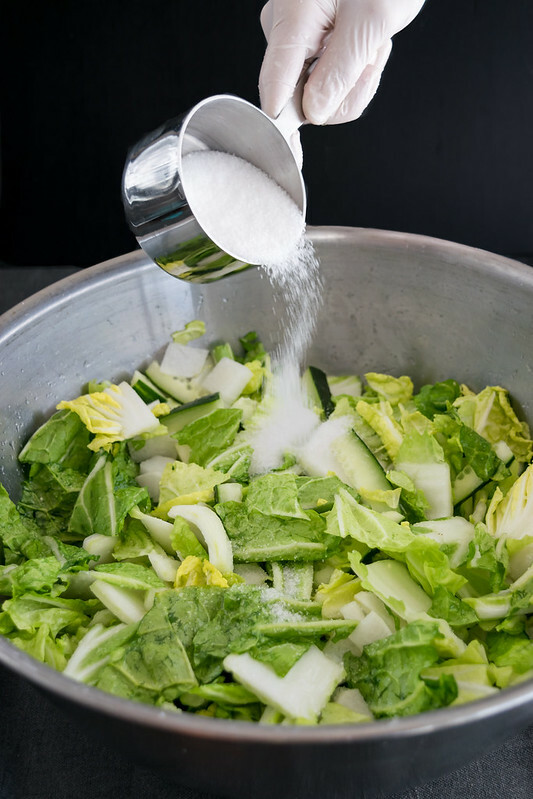 Don’t panic when you see this calls for a full cup of sea salt—it is only used to prepare the vegetables for fermentation and is rinsed off afterwards. 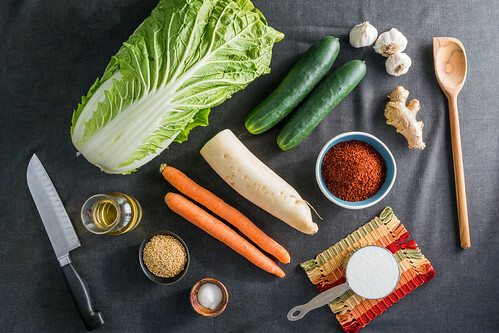 Because of this natural fermentation process, kimchi is not only delicious, but is also a healthy probiotic with active cultures (like yogurt or sauerkraut) that aid in digestion, immune support, and general bodily health. Plus, it is vegan, gluten-free, and packed full of healthy vitamins! Everybody wins! 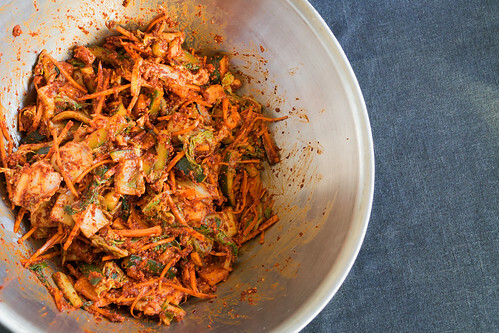 Kimchi is fun and easy to make: you just chop a few vegetables, let them rest for an hour, then combine them with an intensely-flavored garlic-ginger-pepper paste that takes just seconds to make in the food processor. 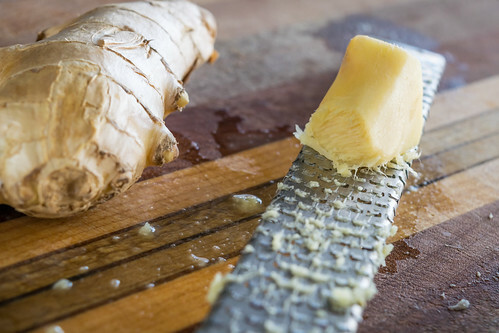 Sometimes traditional foods—especially those from a culture that is not our own—can seem intimidating to prepare at first, but this simple recipe makes the process easy and accessible for any home cook. Kimchi will last for months, although it won’t in our house because we can’t stop eating it! Besides just snacking, it can also be served as a side dish by itself, and is irresistibly delicious on top of a warm bowl of rice, but that is just the beginning! This spicy, garlicky, gingery delicacy can be used in many creative ways: Kimchi fried rice, kimchi grilled cheese sandwiches, kimchi burritos… Have fun, and let your culinary imagination go wild! 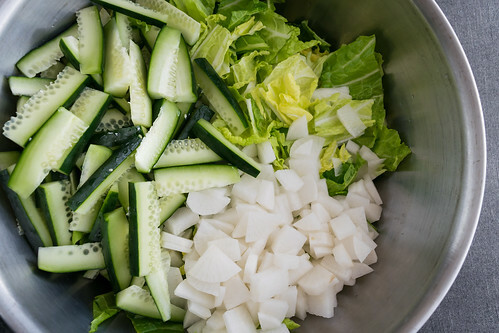 Place the prepared cabbage, daikon, and cucumber in a large bowl (the biggest one you have), and toss well. Sprinkle some of the salt over the top, then, wearing food-safe gloves, toss the vegetables with your hands, coating them evenly. Add more salt, and toss again. Continue adding a bit at a time while tossing until all the salt has been added and the vegetables are evenly coated. Cover the bowl loosely with a clean kitchen towel, and let sit at room temperature for 1 hour. While the vegetables are sitting, make the pepper paste. 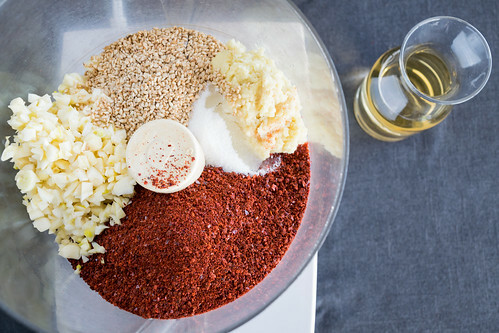 Combine the rice vinegar, minced garlic, grated ginger, gochugaru powder, sesame seeds, and sugar in the bowl of a food processor, and process until blended. Scrape down the sides and process again until a thick paste forms. When the vegetables are done sitting, you will notice a lot of liquid has collected in the bowl. 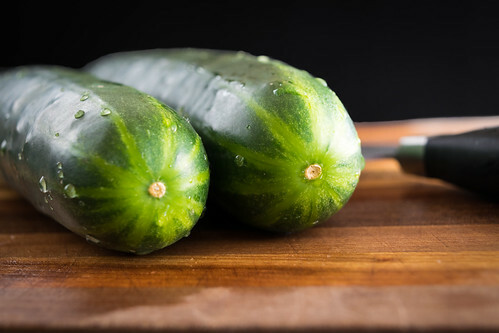 Transfer the vegetables to a strainer, and rinse them well under cold water, using your hands to toss them, ensuring that all surfaces have been evenly rinsed. 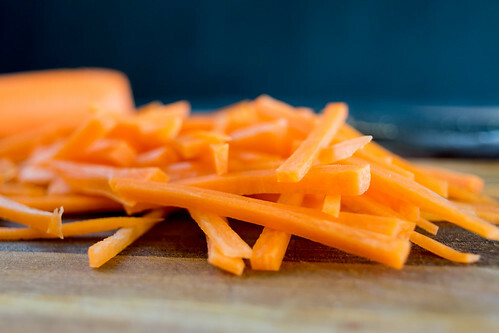 Let them drain briefly, then in batches, pat the vegetables dry with a clean lint-free towel. Rinse and dry the mixing bowl, then place the vegetables back in the bowl, and also add the julienned carrots and the red pepper paste. Wearing food-safe gloves, use your hands to toss the mixture until it is evenly mixed and every surface of the vegetables is coated with the paste. Transfer the mixture to one large 8-cup jar, or a few smaller jars, packing it in tightly so no air bubbles remain, and leaving about 1 inch of space at the top of each jar. Let the jars sit tightly closed on the counter at room temperature for 24 hours (or 2 days if your kitchen is chilly), then transfer to the refrigerator for storage. Enjoy! — Gochugaru powder is available in Korean grocery stores or online. 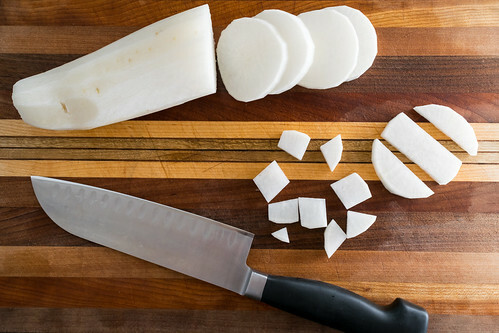 — When buying daikon, you may see two varieties at the market: longer and thinner Japanese daikon (pictured here) as well as the more rounded Korean variety. The flavors are similar, and either kind will work perfectly here. — Be sure to use gloves when tossing the food by hand. Spicy peppers and bare hands can be a painful combination. — Feel free to sample the kimchi at any time before or after it goes into the fridge. The flavor will develop and change over time as the kimchi ferments, and the jar will last for weeks. Fermentation is the goal here, not spoilage, so if you see discoloration or white mold, throw it out. 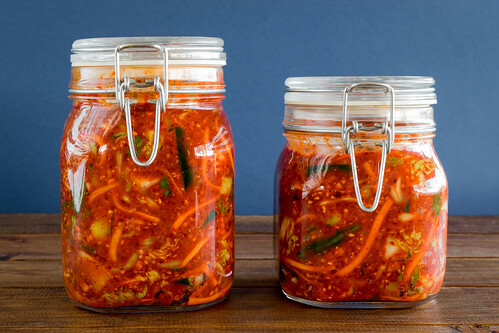 — To keep the kimchi fresh, whenever you remove some from the jar, be sure to press the vegetables back down so they remain in the sauce and do not dry out. This will keep them from drying out and spoiling. — This variety is called mak kimchi (literally “careless” or “rough” kimchi), because the cabbage is cut into pieces before use. 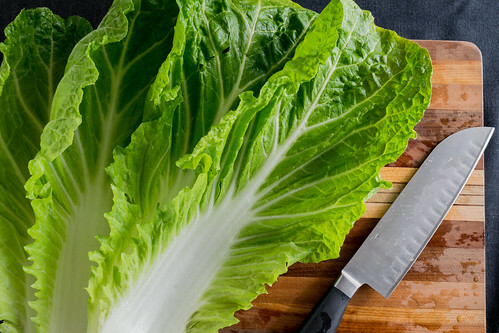 In traditional baechu kimchi, the cabbage stays whole, and is cut into slices for serving. Hi I’m so excited I found your blog and this recipe is it possible to make this mild. Hi Haleemah! Thanks for writing! We haven’t tried this yet, but the less gochugaru powder you use, the lower the spice level will be since that is where the heat is coming from. Let us know how it turns out! Nice to meet you! What perfect timing! 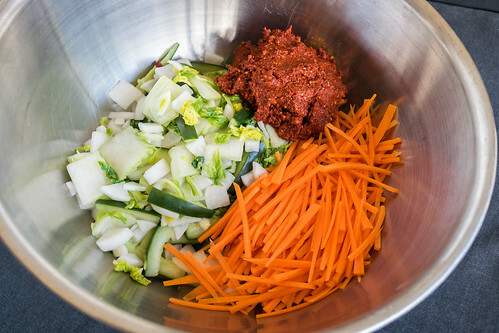 Getting ready to try my hand at kimchi making (again) and this recipe looks wonderful! Last time tried to modify a traditional recipe to be vegetarian with less than stellar results. Very excited to try this recipe – thanks!!! That’s great to hear! 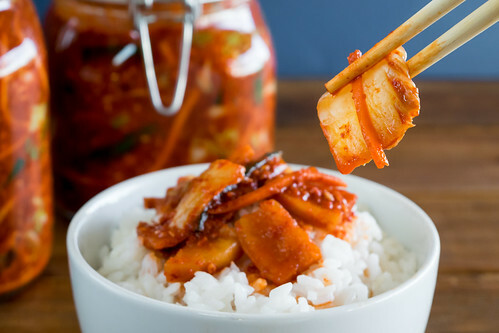 It can be difficult to find vegetarian kimchi recipes online, so we’re happy to help! Have fun, and let us know how it turns out! Thank you so much Deb! That means so much to us! Have fun making the kimchi, and let us know how it goes! We love following you on Instagram and seeing your beautiful food and pottery!